The philosophy and practice of Open Science is at the centre of ASTERICS activities. 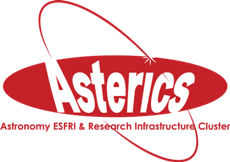 A key aim of ASTERICS has been to open up the astronomy and astroparticle physics facilities to a wider constituency of stakeholders, from technical audiences to policy makers to the general public. For the final category, we achieve this through crowdsourcing experiments. The rich, complex and large data sets from the coming generation of astronomy and astroparticle physics facilities are very well suited to mining through crowdsourcing. From a scientist's perspective, citizen science is not (simply) outreach; rather, it is primarily a tool for data analysis to achieve science goals. In particular, the citizen science experiments we have developed in ASTERICS are carefully selected to be well-aligned with the major science goals of the facilities. The crowdsourced classifications are also ideal for training machine learning. This makes it possible for human effort to be redirected onto more difficult edge cases, creating a synergistic virtuous circle between machine and human classifications. From a participant's perspective, citizen science directly engages the volunteers with the process of scientific knowledge discovery. Dialogue and debate with the science teams are key to the success of a crowdsourcing experiment. We have also embedded education resources into the citizen science projects for volunteers to take their interests further, and created a series of promotional animations. The Cosmic Ray Extremely Distributed Observatory (CREDO) collaboration is an ongoing research project involving scientists and the public from around the world. Learn more about multi-messenger astrophysics and ASTERICS in our videos. Part of our mission is to engage with the general public as well as technical audiences. That is why we are developing citizen science experiments.